Business Requirement: Dependent children of employees lose their dependent status when they reach the age of 26. Their benefit coverage terminates at the end of the month following loss of eligibility and they become eligible for COBRA coverage. Sounds simple enough, right? We configured a termination rule and set it to “Day 031 of Month.” The end date of the benefit plans will be the last day of the month in which the event occurred. As we tested the configuration, everything seemed to be working perfectly until we tested a scenario where the dependent child turned age 26 on 11/1/2013. When we ran the COBRA Letter Generation program (HRBENUSCOB02), SAP showed the COBRA coverage period starting as of 11/1/2013 to 10/31/2016, which means the regular benefit coverage of the dependent terminated on 10/31/2013. After reviewing this with the business, the expected result from this test was that the dependent’s regular benefit coverage would terminate at the end of the month in which the dependent turned age 26. In this test case, the coverage should have gone until the end of November. But based on the termination rule we configured and the way SAP interpreted loss of dependent status, the actual result was that the day the dependent turned age 26 was the actual day the dependent lost benefits eligibility. Hence, the last day of coverage was 10/31/2013 and not 11/30/2013 as expected. 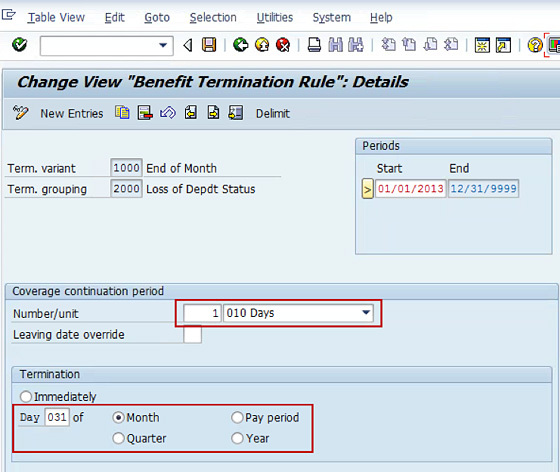 For SAP to terminate the regular benefit coverage at the end of the dependent’s birth month when turning age 26, we configured a separate termination grouping and a termination rule that is used only for the loss of dependent status. Other types of benefit terminations will continue to use the original termination grouping and termination rule. Below are the configuration steps in more detail. You can use this feature to define and set the different termination groupings to group employees with common benefit plan coverage periods within a benefit program. 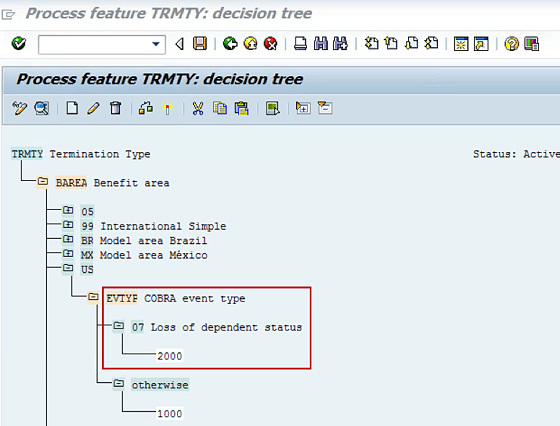 For this specific business requirement, we created a termination grouping for loss of dependent status and used the termination grouping feature TRMTY to assign employees to this termination grouping when a COBRA event type “loss of dependent status” occurs. Next, we created a termination variant which is used to group termination rules. You can assign multiple termination rules to a single termination variant. The last step is to create the termination rule for the combination of termination grouping and termination variant created above. When we first configured the termination rule, we selected the termination option of end of the month (Day 031 of Month). We know this termination rule didn’t apply when the termination of benefit coverage was due to loss of dependent status. For SAP to terminate benefit coverage at the end of the month taking into consideration the actual day and month the dependents turn age 26 and not the last day the dependent was age 25, we extended the coverage continuation coverage period by one day plus the termination option of end of the month (Day 031 of Month). 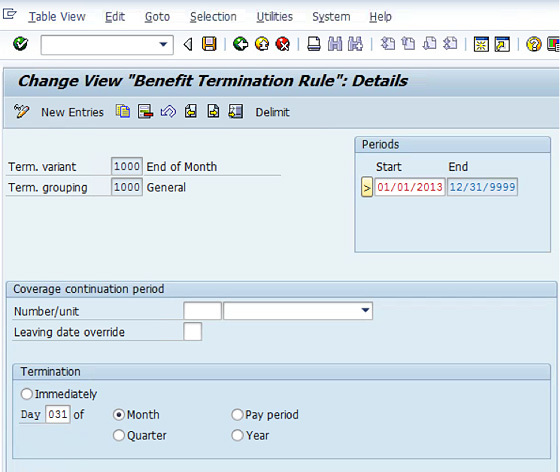 By adding this configuration to the termination rule for the loss of dependent status, whenever a dependent is turning age 26 on the first day of the month (like 11/1/2013 from our test scenario), their benefit coverage will now terminate at the end of their birth month instead of the end of the previous month (like 10/31/2013 with the old termination rule). This entry was posted in Talk Techie to Me and tagged Benefits, Benefits Termination Rules, Loss of Dependent Status, SAP. Bookmark the permalink.